Held annually at the International Restaurant & Foodservice show, the U.S. Pastry Competition brings the best up-and-coming pastry chefs into the spotlight to determine the “Pastry Chef of the Year.” With a different theme each year, this year the challenge will be “Modern Masters Come to Chocolate,” testing pastry chefs to create edible delicacies based on the works of artists such as Pablo Picasso, Salvador Dali, and Vincent van Gogh. We’re eager to see what they come up with. 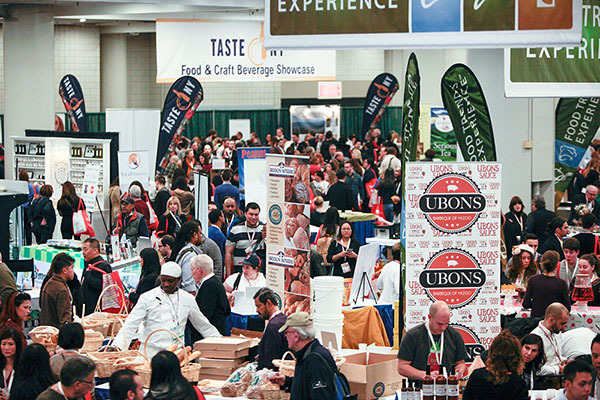 From Japanese specialty food products to local craft spirits, beers, wines, and ciders, the 500+ exhibitors at the International Restaurant & Foodservice Show offer restaurateurs plenty of options to fill their pantries and freezers - not to mention all the samples. There will also be a special dessert pavilion, the gourmet pavilion, and the Sabor Latino pavilion showcasing specialty Latin foods. The Food Trends Experience pavilion should also be interesting, as it features the latest emerging trends in the foodservice industry. The live demos the International Restaurant & FoodService Show aren’t just any culinary presentation, they are live shows by some of the best known celebrity chefs in the business. Think Donatella Arpaia, the head judge of Iron Chef America, and Roxanne Spruance, the head chef of Kingsley, showing off the latest culinary trends in the Culinary Demo Theater. This is something you’ll want to see. There’s also an excellent educational component to the trade show. With over 40 different learning sessions, tradeshow attendees can get insight from industry leaders on topics ranging from restaurant management, food safety, nutrition, team building, marketing and much more. The International Restaurant & Foodservice show is also offering extended workshops on current topics, like how to continue profiting in spite of rising costs, and the benefits of buying and sourcing local ingredients. Consult the full schedule here. And when you’ve had enough of the show, take the short walk back to The New Yorker to unwind and get ready for another day at the International Restaurant & Foodservice Show 2017.